Labour has suspended a candidate for May's local elections from the party after allegations of anti-Semitism emerged against her. Virginia Keyes, who is contesting a seat in the Torbay Council elections in Devon, has been suspended by the party pending an investigation. Her suspension comes after Countdown presenter Rachel Riley suggested Ms Keyes had shared a series of anti-Semitic posts online. Ms Keyes said she could not comment. Despite her suspension, the Torbay Constituency Labour Party (CLP) member will still appear as a Labour candidate for the 2 May elections in the Tormohun ward because of a technicality. Her suspension came after the 4 April deadline for declaring candidates, meaning Ms Keyes can still campaign for the seat, but a party source confirmed it would not support her campaign. A Labour Party spokesperson said: "Individuals who are suspended from the party can't stand as party candidates. "Due to electoral laws, those who are suspended after the deadline can't be removed from the register, but they are not party candidates." The spokesperson said the party took all complaints of anti-Semitism "extremely seriously" and was "committed to challenging and campaigning against it in all its forms". 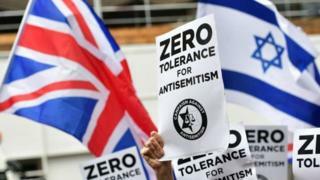 "All complaints about anti-Semitism are fully investigated in line with our rules and procedures and any appropriate disciplinary action is taken," the spokesperson added. "We can't comment on individual cases." Ms Keyes told the BBC she was not able to comment at this time.